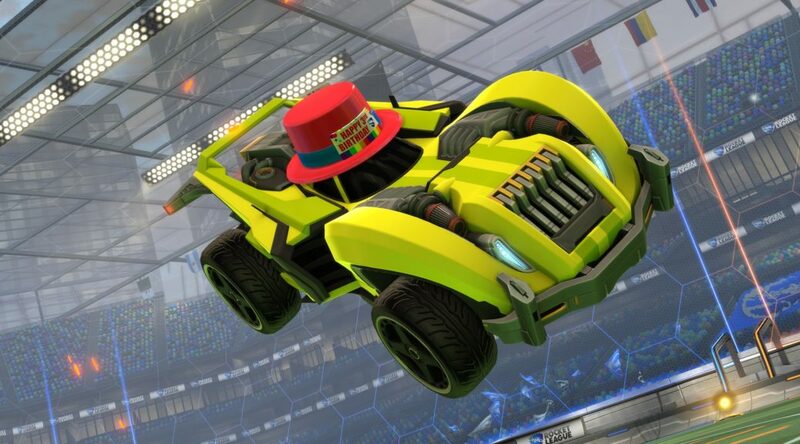 Rocket League is about to celebrate its Third Year Anniversary and what better way to do it with a near-month-long celebration. From 9 July 2018 to 23 July 2018, Rocket League will be having their anniversary event, with an anniversary playlist, and retro arenas, and special customisation items. You can read their press release below or find out more from their site here. Can you believe Rocket League is nearly THREE years old and Supersonic Acrobatic Rocket-Powered Battle-Cars is about to turn TEN? Oh, how time flies! To celebrate both milestones, we’re throwing an in-game birthday bash Event and you’re all invited! We’re changing up how you earn Customization Items during the Anniversary Event as well. There will be no Event Crates this time around, with all of the new items available by redeeming SARPBC 10th Anniversary-themed ‘Balloons,’ which are earned by playing matches online. Check out screenshots of some of the items below! Along with new items up for grabs, you’ll also be able to redeem Balloons for a new type of Anniversary surprise! These ‘Golden Eggs’ do not require a Key or Decryptor to unlock, so just crack up to ten of ‘em open to find one of over 60 possible Customization Items from our retired Champions Series Crates. The Anniversary Event ‘Balloons’ expire as soon as the Event concludes. There is no one-week redemption grace period.